We are offering an exquisite assortment of Cab Necklaces that are designed as per the latest fashion trends and contemporary art. Our necklaces are perfect illustrations of blending of traditional and contemporary designs & styles. These are fabricated from high grade metals coated with enamel that are fitted with Cz Balls. One of the necessary accessories required is fashion jewelry. These are made using high quality raw materials and are offered in intricate designs and scintillating color combinations. Our range of jewelry complements any kinds of dress and can be worn on any occasion. These can be customized as per the requirements of the clients. We are Leading Buying agency for Jewellery, Jewellery Books. Unfurling the intricate workmanship of Indian artisans, our array of fashion jewellery is a perfect assemblage that combines different materials like beads, metals, bones, horns, lac etc. Designed by creative brains at work, we source & supply Indian costume jewellery including necklaces, bracelets, earrings, rings and more. Be it intricate fashion jewellery, embellished and printed scarves, amazing fashion collars or beautiful tippets, at Elite you find them all under one roof. 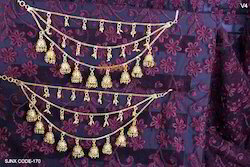 We are offering to our clients a wide rang of Necklace.